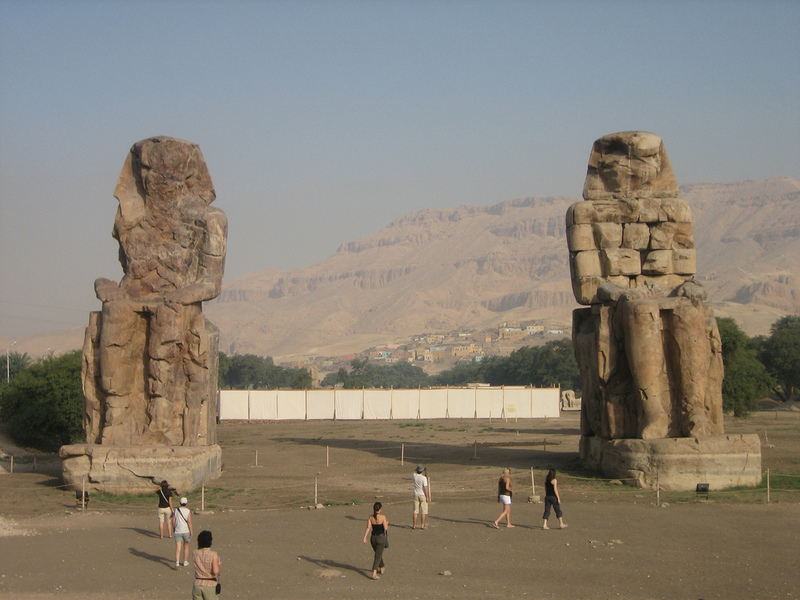 The “Colossi of Memnon” at Luxor in Egypt were a recognised tourist sight in antiquity, because one of them made a “singing” noise at dawn. Few will be aware that the lower portions of the statues are covered with ancient graffiti and inscriptions. This work carried out by T. Attius Musa, Prefect of the 2nd cohort of Thebans. The date is 92 AD. The graffito makes clear that it was the action of the sun that caused the sound. Early travellers drew and published pictures of the statues and the graffiti, the latter often recorded very inaccurately. Some tweets of these can be found here, although not ours. 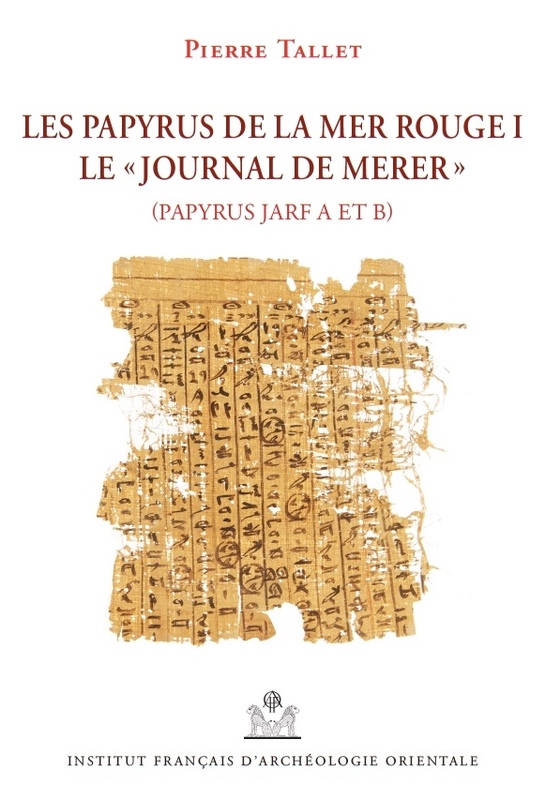 French translations of the inscriptions can be found online here. The statues themselves are actually of Amenophis III, and originally stood in front of his now-vanished mortuary temple. But an earthquake damaged one of them. After this, at dawn, the statue vibrated and gave out this peculiar noise. The noise ceased after Septimius Severus had the statue repaired in the 3rd century AD. While I was looking at the Description de l’Egypte for information about the Serapeum as it was in Napoleon’s time, a whim came over me to look for the now-vanished temple at Armant (ancient Hermonthis), some 12 miles south of Luxor. 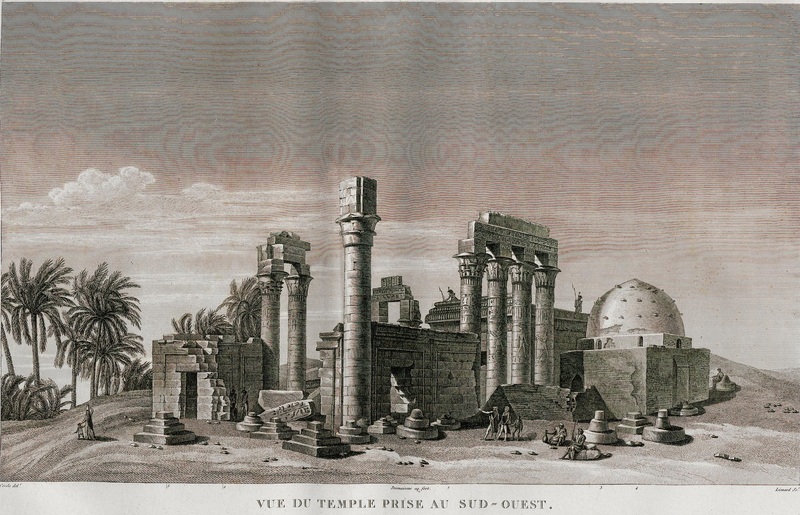 The temple was destroyed in 1861-3 in order to get stone to build a sugar factory, which still stands; but I vaguely recalled that there was a picture by the French scholars in the Description. And so there is, in the first volume of plates of ancient monuments, here at Heidelberg. In fact there are three drawings, plus a reconstruction and plan and some drawings of the reliefs. Here is one of them (click on the image for a larger version). The Napoleonic French soldiers standing on the roof are distinctive! I then began to search for information about the temples of Armant. This quickly showed the limits of the internet – there is practically no information to be had. There was a great temple of Montu-Re at Armant, of which little remains. In the grounds of this, just as at Dendera, a smaller temple was built, the one above, which was rebuilt by Cleopatra. It was a mamissi, celebrating a birth, much like the one at Dendera. Finally there is a temple with bull-burials. But you try to find any maps of all this! I believe that there is a monograph, written in 1940 or thereabouts – offline, of course. Clearly someone needs to upload information about Armant (or Erment as it is sometimes known). 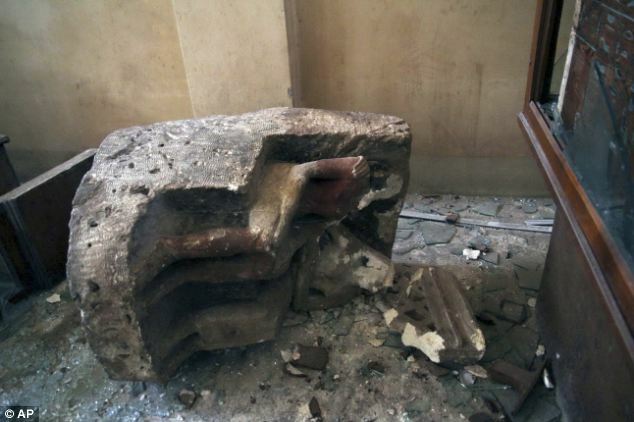 There are still remains of all these temples; although apparently none are open to the public. I get the impression that parts of a pylon, and two Roman gateways, still exist. 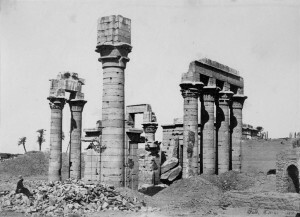 Cleopatra’s temple at Erment. 1857. Francis Frith. That’s right – there is a photograph of the place! It was taken, unbelievably, in 1857, only 4 years before demolition started. In fact there are a number of photographs. A certain Maxime du Camp published another in “Egypte, Nubie, Palestine et Syrie, 1852,” and Felix Teynard one in “Egypte et Nubie, 1858”. I was sadly unable to find digitised copies of this. Well, I had no idea when precisely photography started. Apparently it was invented by Daguerre who experimented in secret between 1835-1839. What happened next was startling: his process was purchased, in return for a pension, by the French government, which made it available to the world as an act of benevolence. Needless to say not everyone felt benevolent – some adventurer in England managed to get a patent in, which meant that English people had to pay for what everyone else could use for free. There are parallels here to Google Books! But as soon as photography existed, it seems that people started to carry these new “cameras” down the Nile with them! 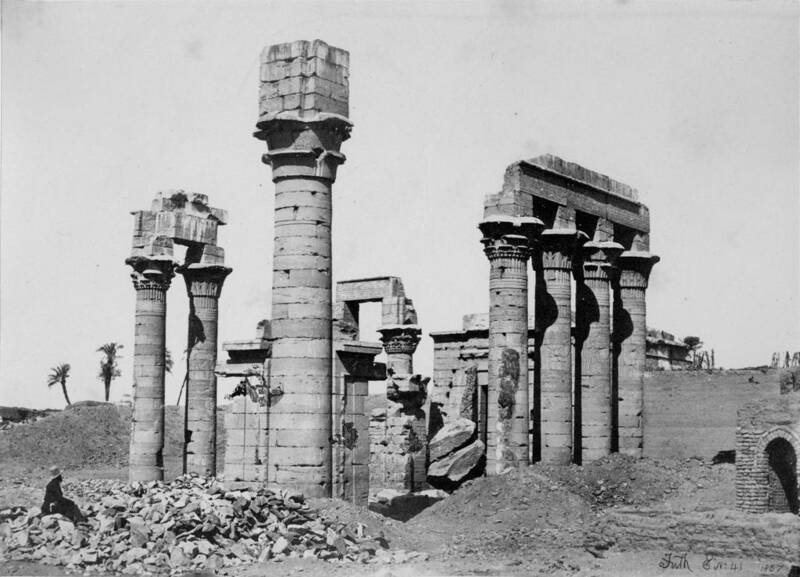 A register of very early photographs of Egypt might reveal many interesting things. Those of us who have visited Egypt and experienced the way that possession of a camera marks the holder for extortion by officials and self-appointed “guardians” of monuments may be permitted to wonder whether the invention of the first camera was swiftly followed by the invention of the first Egyptian camera fees! 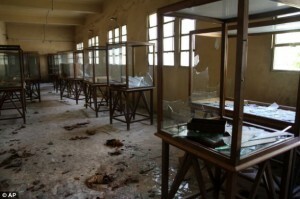 Museum in the Upper Egyptian city of Minya was broken into on Thursday. Ministry accused Muslim Brotherhood supporters of breaking in. 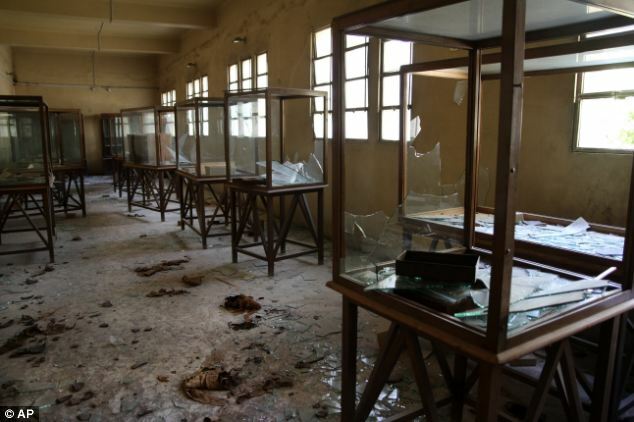 Egypt’s famous Malawi National Museum has been ransacked, looted and smashed up by vandals in another example of the recent unrest in the country. Photos of the damaged artefacts and empty display cases were released this afternoon as supporters of deposed President Mohamed Morsi fought a gunbattle with security forces in a Cairo mosque. 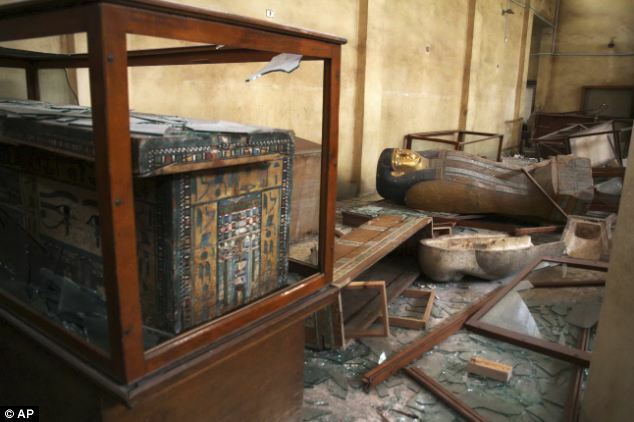 According to a statement made by the Ministry of Antiquities, the museum, in the Upper Egyptian city of Minya, was allegedly broken into and some artifacts were damaged and stolen on Thursday evening. 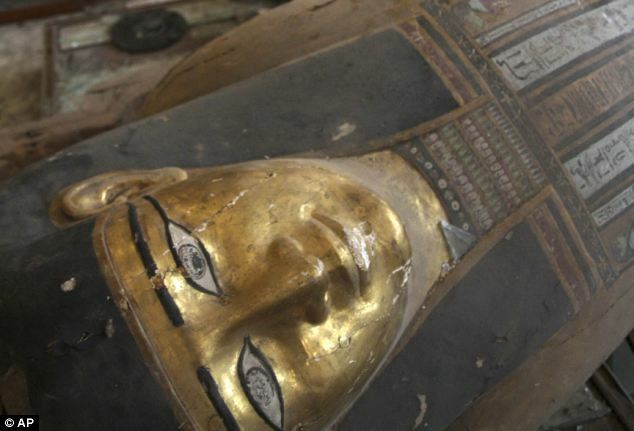 It not yet clear what is missing – a list is being compiled to ensure the artefacts are not smuggled out the country. We need hardly ask, in these days of political correctness, when expressing negative opinions about certain favoured groups is a matter for the police, why the proprietor of the newspaper has instructed his staff to ensure that ordinary mortals are not permitted to express their disgust. What hope for the civilised world, when the defenders of it are not permitted even to object to the actions of the barbarians? It is as if Luke Skywalker were not permitted to mention that Darth Vader had something to do with the Death Star. Such a path must bring ruin on the world. While we are still permitted to say anything — the BBC has omitted to report on all this — here are some more of the photos that the Mail posted. Update: I see no sign of BBC reporting this story. Protect the Pope has a list of further attacks on churches, equally unreported. 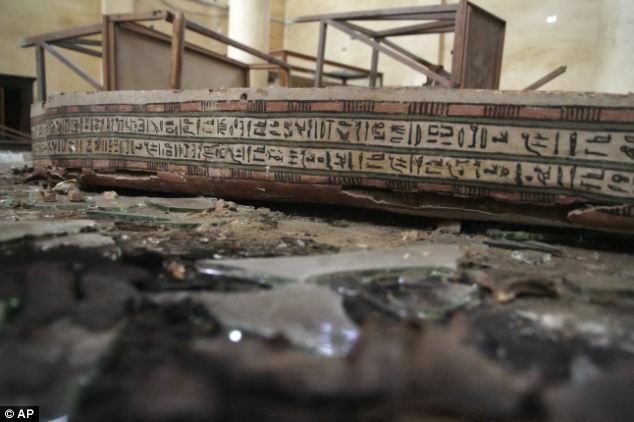 At least 25 churches across Egypt have been attacked by arsonists in a wave of anti-Christian violence, a non-governmental group has said. Homes and businesses have also been targeted, the Egyptian Initiative for Personal Rights (EIPR) says. Witnesses described the attackers as shouting slogans in support of ousted Islamist President Mohammed Morsi. But his Muslim Brotherhood supporters say it is the military regime that is instigating the violence. It is impossible to say whether the decision to break up the pro-Morsi camps in Cairo was the trigger for the church attacks. But Egypt’s minority religion has often borne the brunt of discrimination and violence from some Islamists. The article does not state at any point who is actually doing the violence, preferring to suggest that these are claims by one group. We should note the scare quotes in the heading, and the claim that violence is from “some Islamists”. Perhaps the BBC could do a little more, and use its correspondents on the ground to investigate the facts?